The world’s first passenger Airline was DELAG (Deutsche Luftschiffahrts-Aktiengesellschaft, or German Airship Transportation Corporation Ltd). It was founded on 16 November 1909 with government assistance and operated Zeppelin rigid airships manufactured by the Luftschiffbau Zeppelin Corporation. Its headquarters were located in Frankfurt, Germany. 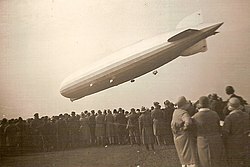 In 1919 the DELAG airship Bodensee began scheduled service between Berlin and southern Germany. The flight from Berlin to Friedrichshafen took 4-9 hours, compared to 18-24 hours by rail. Bodensee made 103 flights and carried almost 2,500 passengers, 11,000 lbs of mail, and 6,600 lbs of cargo. DELAG also employed the world’s first flight attendant, Heinrich Kubis, who began caring for passengers in March, 1912. By July 1914, one month before the start of World War I, DELAG's Zeppelins had transported 34,028 passengers on 1,588 commercial flights; the fleet had flown 172,535 kilometres in 3,176 hours.